Don’t wait to purchase your ticket to this year’s Taste of the Holidays! This very popular event sells out every year! Tickets are $15 and can be purchased from an Ambassador or at the Chamber office. No tickets will be sold at the door – advanced sales only. Come out and enjoy the evening. Hopefully you will find some great holiday gift ideas too. There will be many vendors with samples of tasty treats and beverages. Hope to see you there! 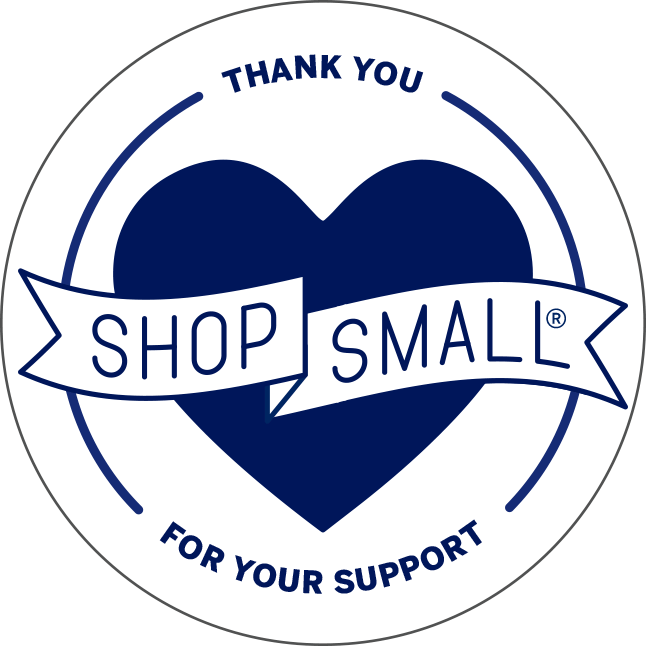 Do your holiday shopping on Small Business Saturday and support our community in a big way! Small Business Saturday is one of our favorite community events. This year the Chamber will be hosting a block party on Saturday, November 24 from 10:00 AM to 12:00 PM on Washington Avenue, the block east of Main Street. Come check out our Welcome Station that includes information, giveaways, cookies, cider, refreshments and at 10:00 AM we will be dropping 100+ ping pong balls for you to gather and redeem at the Welcome Station for local gift cards. Also new this year, is our thinkLOCAL campaign. This campaign will replace Bring It Home campaign with a new logo, new ideas, new support for our local businesses and education for consumers. Be watching for more information! Are you ready for “A Night Under the Stars”? This year’s Chamber Annual Event will be an 80s Prom theme, and will be held on Friday, January 18, 2019, from 5:30 PM to 10PM at the Crow River Winery. It will be Totally Tubular! 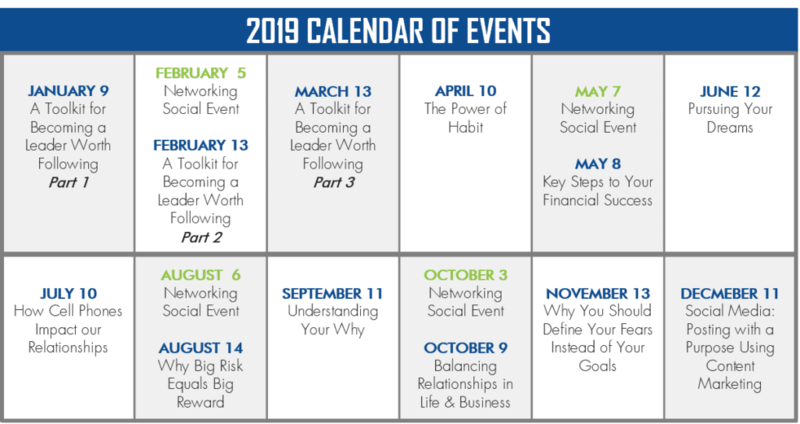 To register for the 2019 Annual Event use our online Annual Event Registration Form or by mailing/emailing a printable Annual Event Registration Form to the Chamber by Friday, January 11, 2019. The Hutchinson Chamber of Commerce and the Hutchinson Jaycees, in a joint effort, are proud to award deserving individuals their Community Awards. 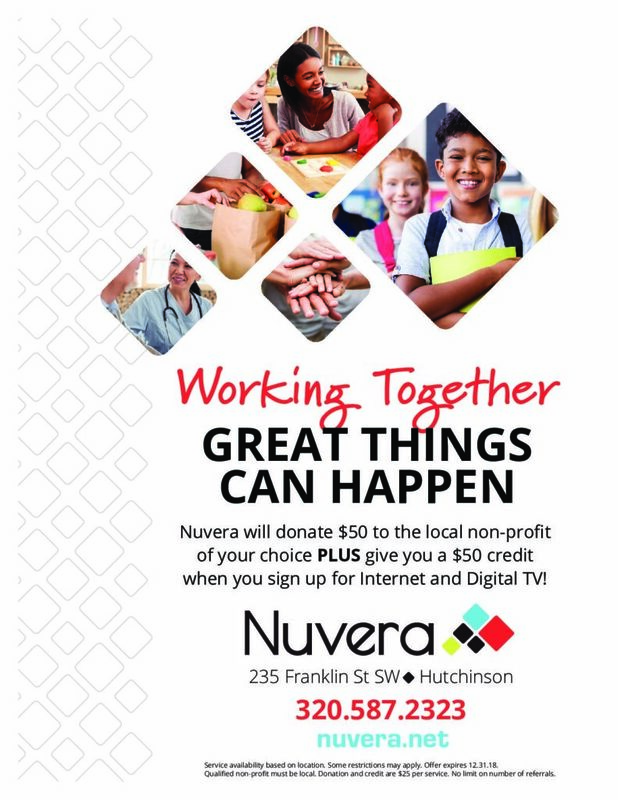 Do you know someone in our community that is doing great things? Nominate them today! Submit your nomination using the online Community Award Nomination Form or by mailing/emailing a printable Community Award Nomination Form (pdf) to the Chamber by Thursday, December 20, 2018. 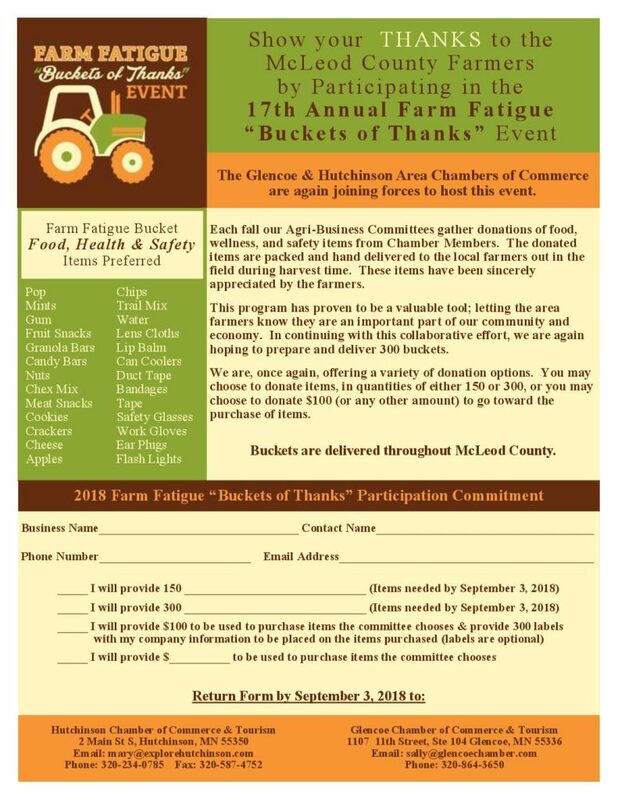 Farm Fatigue Bucket of Thanks & Ag Seminar! Another year of Farm Fatigue’s Buckets of Thanks have been delivered. We extend our sincere thanks to those businesses that donated (pdf). We would also like to send a special shout out to those who helped collect, package and deliver the buckets. This special delivery would not be possible without you! ATTENTION – The University of Minnesota Extension and the Hutchinson Chamber are proud to be hosting the 2019 Crop Management Input Seminar. 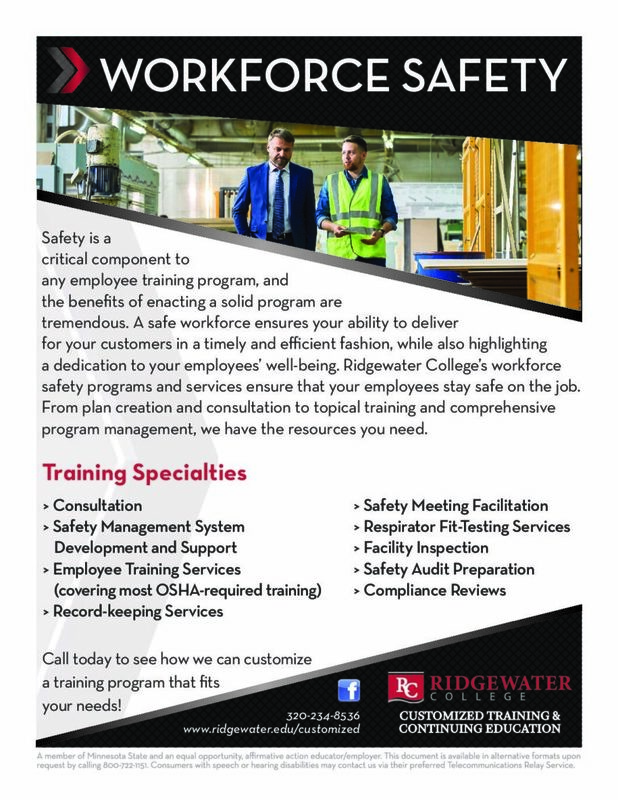 The seminar is set for Thursday, December 6, 2018, from 9:00 AM to 2:15 PM at the Hutchinson Events Center. The seminar will provide education on crop production, brain health and cash flow planning, as well as, handouts and a catered noon meal. 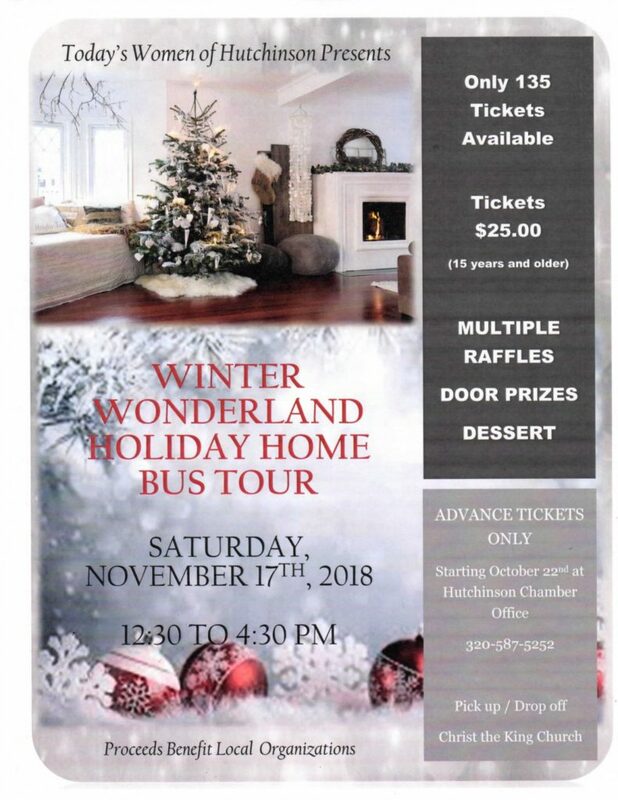 Please RSVP to the Extension Office by Monday, November 26, 2018. They can be reached by phone at 320-484-4334 or by emailing mnext-mcleod@umn.edu. Since 2013, the Chamber has enjoyed granting money to events hosted by nonprofits and for-profits held in Hutchinson. These grants help cover the expense of marketing that covers a radius outside the Hutchinson area for the event. 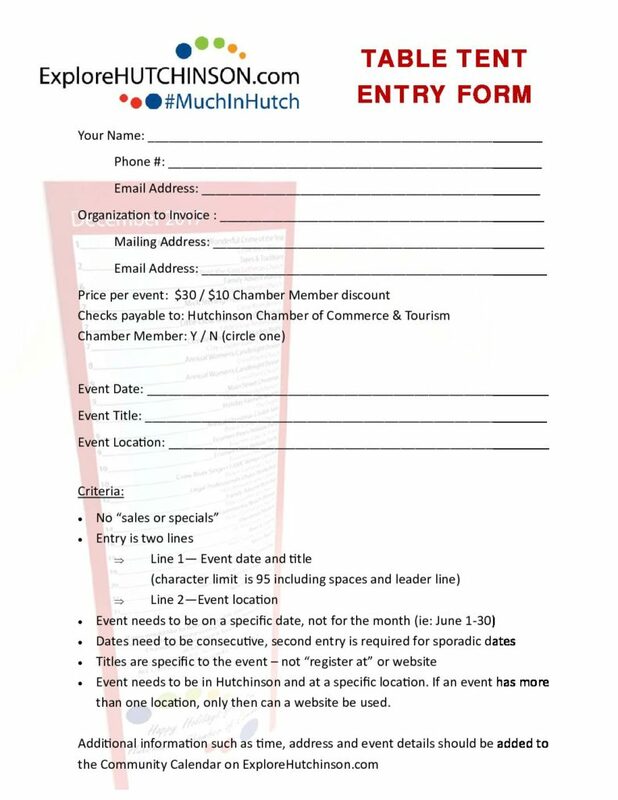 These events help the Chamber bring more people to our beautiful and welcoming community – there really is #MuchInHutch! Tell your friends, co-workers, committees and organizations about the Chamber’s Tourism Marketing Grant. 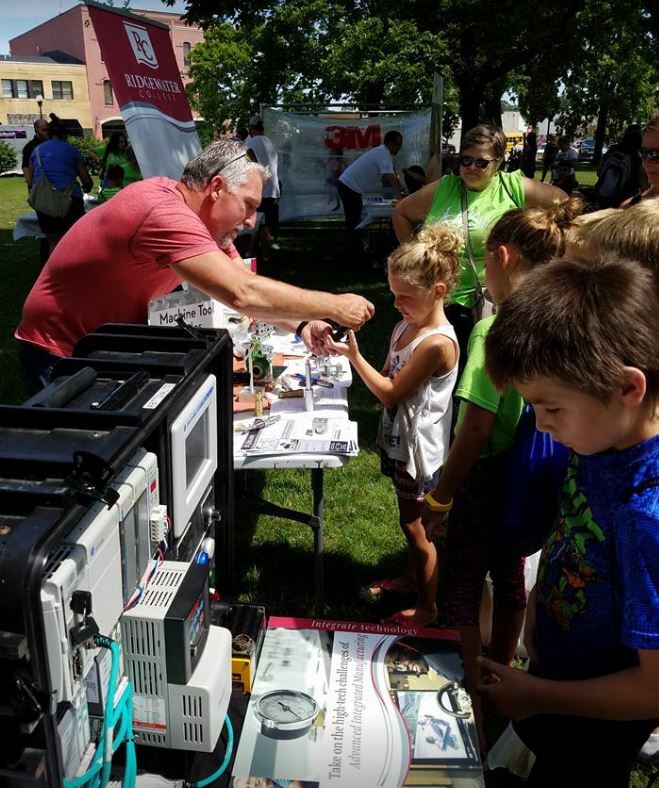 We love to help events as they help us and increase the traffic and awesomeness of Hutchinson! 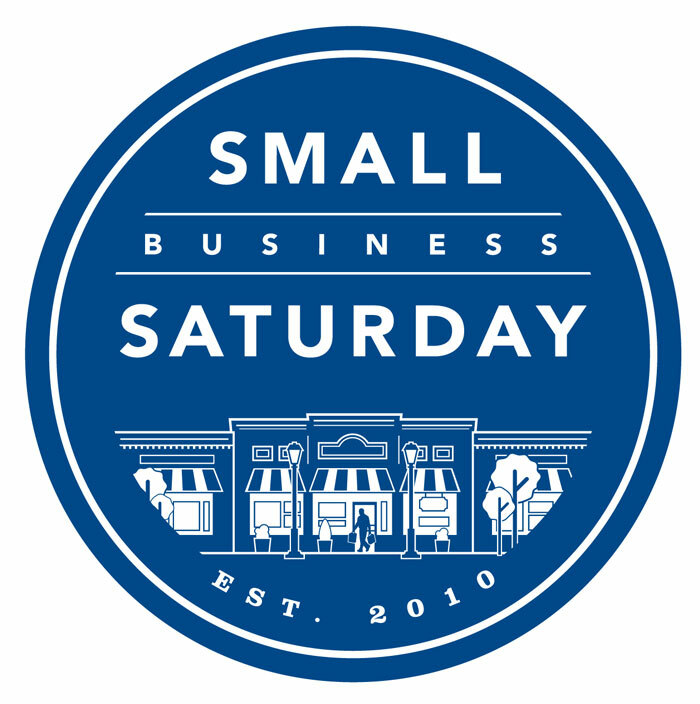 Throughout the month of November, we celebrate and recognize Small B usiness Saturday in place of an individual business. Read our Business of the Month article for more details on what Small Business Saturday is and the details for this year’s event. You can also check out the 2018 Small Business Saturday Facebook page for more exciting information! 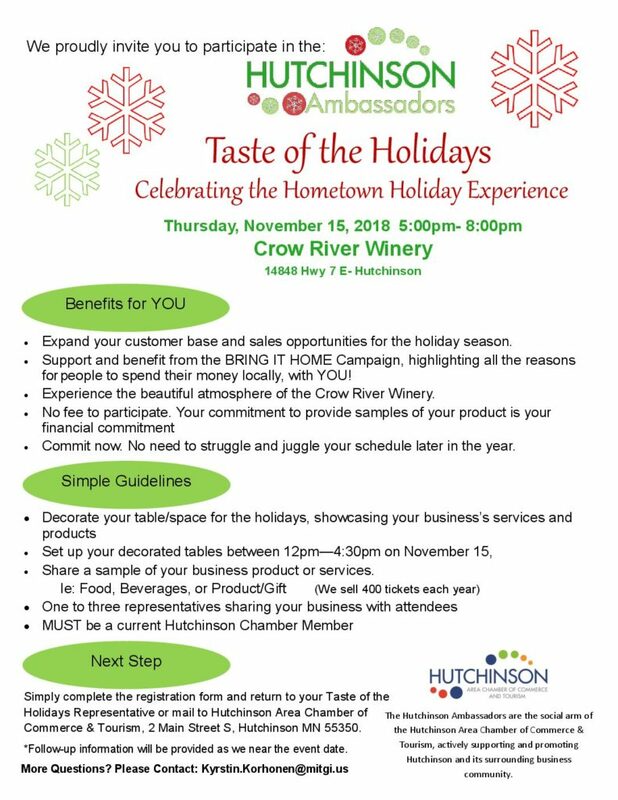 No Business After Hours event will be held in November as the Ambassadors will be hosting the Taste of the Holidays at the Crow River Winery on Thursday, November 15 from 5:00 PM to 8:00 PM. The rest of Mary’s article can be found on November’s Something from Mary blog. 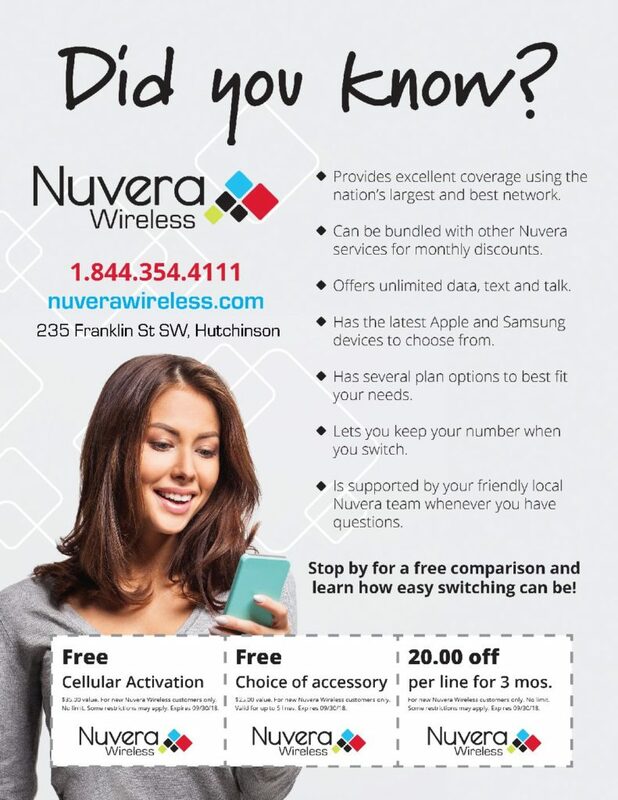 Are you looking for a way to boost an upcoming Hutchinson event? The Chamber prints and delivers 900 table tents around the community. Make sure you get your event added to the table tents! The cost is $30/event listing for community members and Chamber Members receive a $10 discount per event listing. 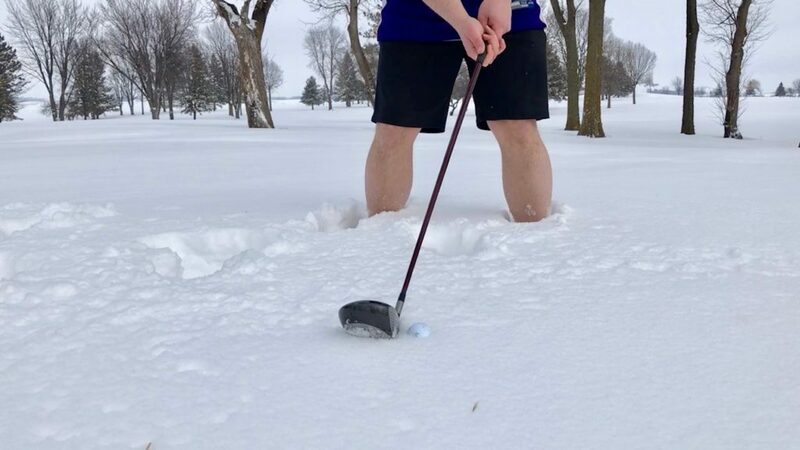 The deadline for Quarter 1 (January – February – March 2019 events) is December 1, 2018. The Agri-Business Committee is announcing last call for donations for the 2018 Bucket of Thanks Event. Their donation deadline is September 3rd. Donations needed are food, wellness and safety items. The Committee is looking forward to assembling the buckets for the anticipated and very much appreciated “out in the field” delivery day during harvest time. 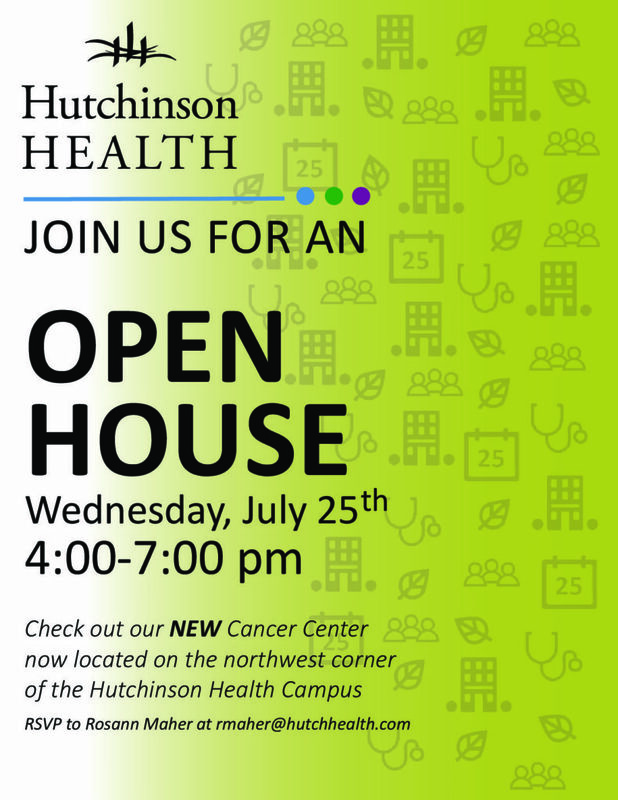 If you have additional questions, please feel free to call the Chamber at 320-587–5252 or email us at info@explorehutchinson.com. We hope you will join us for the 44th Annual Arts & Crafts Festival. The festival dates and times are Friday, September 14th 10:00 am – 6:00 pm and Saturday, September 15th 9:00 am – 4:00 pm. This festival is full of handmade items and crafts from vendors that travel from all areas of the country. 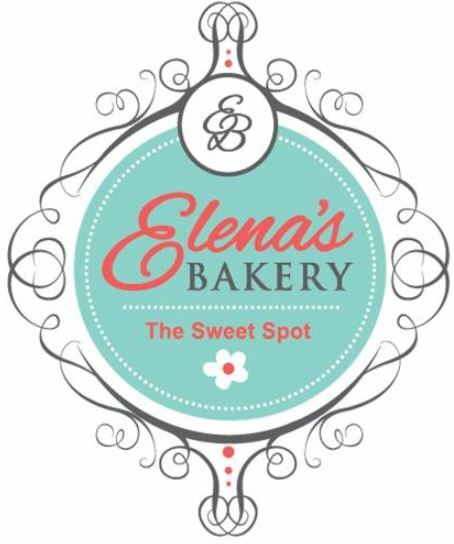 We have several returning vendors and many NEW vendors that are eager to share their creations with you. Please invite your family and friends to attend this community favorite event! For more information follow the Arts & Crafts Festival Facebook Event Page. 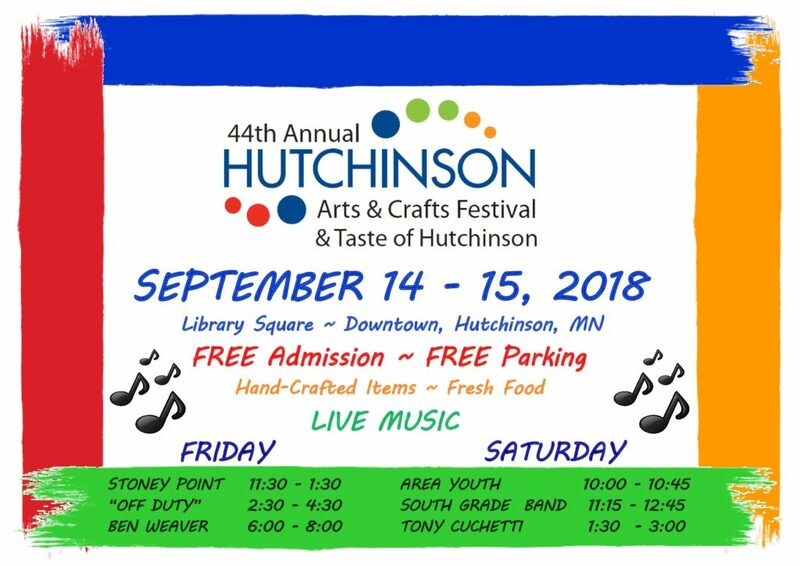 The Annual Taste of Hutchinson is held in conjunction with the Arts & Crafts Festival. Along with the delicious food vendors, the Ambassadors bring you live music! This year’s line up includes: Stoney Point, “Off Duty”, Ben Weaver, Area Youth, South Grade Band and Tony Cuchetti. For more information follow the Taste of HutchinsonFacebook Event Page. LOOKING FOR A WAY TO GET INVOLVED??? ARTS AND CRAFTS VOLUNTEERS ARE NEEDED!!! With 10,0000 – 12,000 people attending each year, volunteers are critical. The 2018 Arts & Crafts Volunteer sign up sheet is the easiest way to sign up to volunteer. This online document automatically save, so there is no need to click save. 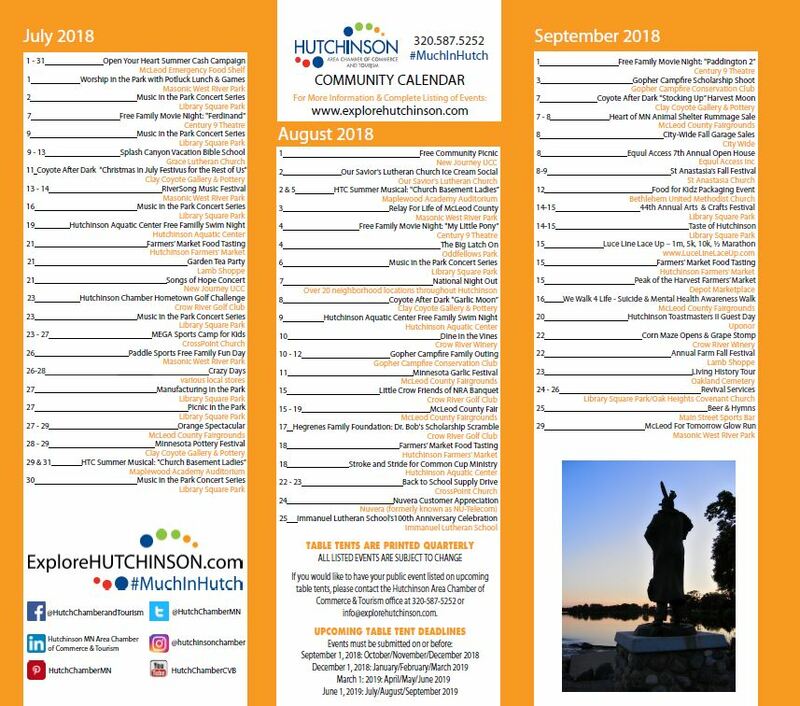 Otherwise, to speak with someone at the Chamber about volunteer opportunities, please call us at 320-587-5252 or you can email us at info@explorehutchinson.com. The September Business of the Month is American Family Insurance – William ”Bo” Young Agency. We are honored to have American Family Insurance – William ”Bo” Young Agency as September’s Business of the Month. 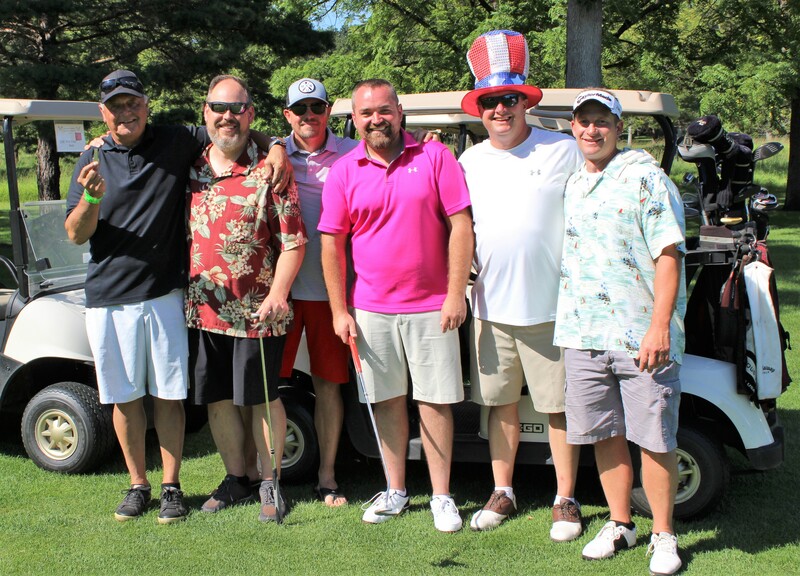 For the Am Fam story and to see what they enjoy most about their Chamber membership read our September Business of the Month article. We would like to thank the following members for renewing their partnership with the Chamber! 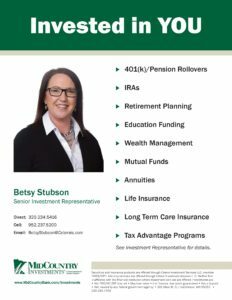 Business After Hours is not held in September. Business After Hours resumes on October 11th with Tiger After Hours. The TigerPath teachers will be on hand to explain how they will help students discover their talents, develop their skills and build an exciting, rewarding career! “Find your own path” – that’s what it’s all about! Email the Ambassadors if you have any questions or would like more information. The rest of Mary’s article can be found on September’s Something from Mary blog. 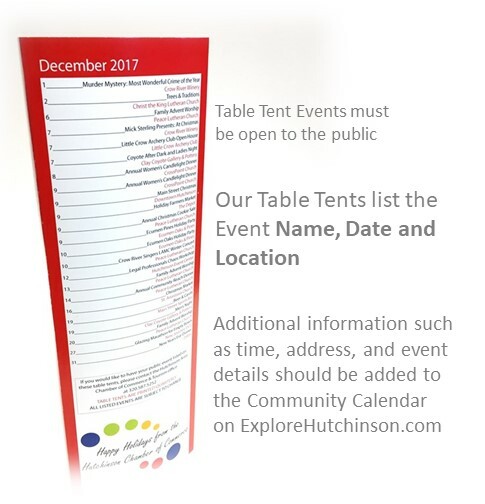 Quarter 1 Table Tent Deadline is December 1st 2018! The Chamber prints and delivers over 900 table tents around the community. 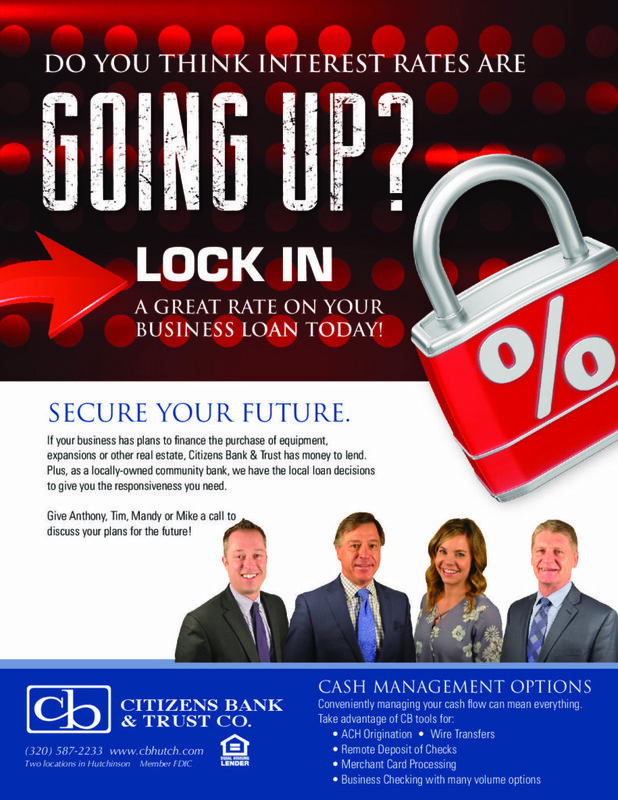 Are you looking for a way to boost an upcoming Hutchinson event? Make sure you get your event added to the Chamber’s table tents. The cost is $30/event listing for community members and Chamber members receive a $10/discount per event listing. Also, if you submit an event to our table tents, make sure to add it to the online Community Calendar. The Community Calendar averages about 100 views a day, so don’t forget to utilize it! Submitting an event to the Community Calendar may be done through your Chamber Member Portal or directly on the Community Calendar page!